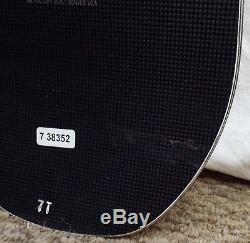 This snowboard is in good condition, has wear from normal use. There are minimal scratches and a couple minor chips to the topsheet. A great board for a great deal! All snowboards receive a complimentary basic tune. If you would like to upgrade this service for added performance, check out our tune upgrade links below. Ski & Board Tune Upgrades! Stone Grind & Hot Wax Upgrade. When it was first introduced 3 seasons back, the Never Summer Aura Snowboard was the first board in the women's lineup to feature the Ripsaw Rocker Camber profile and hard charging ladies absolutely fell in love! The Aura's mid-firm flex, high-end Carbonium topsheet, and sleek, directional shape is sure to impress. If you have a need for speed, big sweeping carves, and big mountain terrain, then the Never Summer Aura Snowboard is right up your alley. Ripsaw Rocker Camber Features enhanced cambered areas for aggressive edge hold and tremendous pop while maintaining the versatility of Original Rocker Camber. 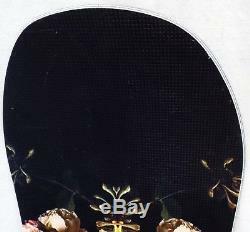 The item "17-18 Never Summer Aura Used Womens Demo Snowboard Size 148cm #738352" is in sale since Wednesday, August 8, 2018. This item is in the category "Sporting Goods\Winter Sports\Snowboarding\Snowboards". The seller is "demo-skis" and is located in Denver, Colorado. This item can be shipped to United States.